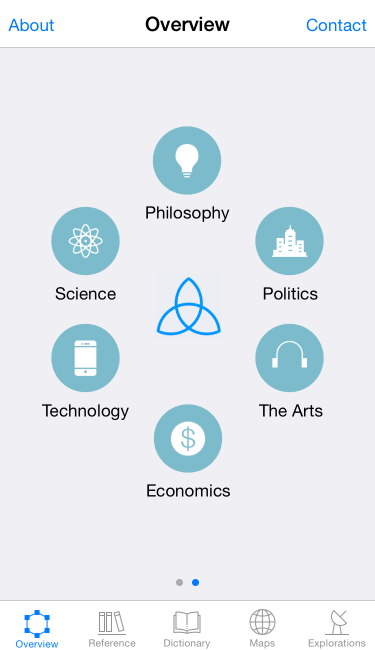 Over the next few months, I will be exploring various aspects of Theologica in a series of posts dedicated to the app. Some will examine its general features, while others will analyze specific content (terms, map points, reference sites, etc). Hopefully, this will not only help explain some of the content choices I made in development, but also serve as point of departure for an extended online discussion of the given topic. To begin, I’d like to examine the Overview tab. 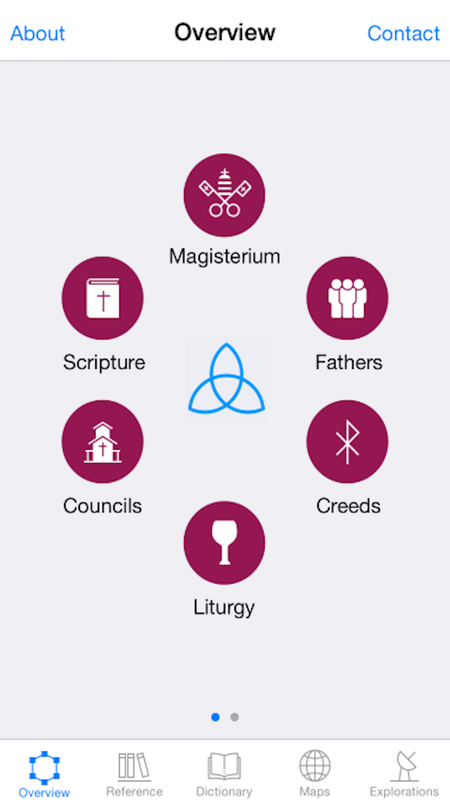 The Overview tab presents a wide-angle view of both the traditional Sources of Theology (Magisterium, Scripture, Fathers, Councils, Creeds, and Liturgy) and the Signs of the Times (Philosophy, Science, Technology, Politics, Economics, and the Arts). Theology is a dialectical enterprise that continuously seeks to better understand the Faith of the Church in a given historical situation. To fulfill that vocation, Theology draws on various Sources in order to faithfully interpret the Signs of the Times. The primary Sources are: The Magisterium, Sacred Scripture, Church Fathers, Ecumenical Councils, Creeds, and Liturgy. All of these Sources, though distinct, are organically related to the life of the Church. Theology is always practiced in a particular historical and cultural context. Thus, cultural trends and indicators of the worldview of modern men and women necessarily affect the way in which the Faith of the Church is understood. It is therefore vital for Theology to pay attention to these Signs in order to fulfill its vocation. These Signs include: Philosophy, Science, Technology, Politics, Economics, and the Arts. While not exhaustive, these aspects of life in the 21st century are the primary factors which affect the thinking of people everywhere. Let’s unpack those two ideas, Sources and Signs, a bit. …it must follow that the primary sources of theology will not be found in the world around us as with other disciplines, but in the revelation to which the Church is the witness. These primary sources, therefore, will be Scripture and Tradition…If one asks, What are these other ways of expressing Christian truth that bring us revelation, the only possible answer is that in effect, they are everything involved in the Church’s life. They include the liturgy, the Fathers of the Church, the creeds and other doctrinal definitions, the evidence of Christian art and archeology, the witness of ordinary believers. Theology proceeds from Divine Revelation as encountered in the life of the Church. While Scripture and Tradition are the primary loci of Revelation, that encounter manifests itself in various aspects of ecclesial life. The Fathers are the earliest interpreters of the Faith, whose reflections serve as important inputs for later Councils, which sometimes express that Faith in Creeds. According to principle of lex orandi, lex credendi (“the law of prayer is the law of belief”) the content the deposit of Faith is most clearly expressed in the concept of Liturgy. Nichols’ statement here is a nice summary of the traditional identification the Sources and is the inspiration behind the first page of the Overview tab; 6 sections that provide detail information on why each is a theological Source. And each Source detail page contains links to relevant reading for further reference. …theologians, within the requirements and methods proper to theology, are invited to seek continually for more suitable ways of communicating doctrine to the men of their times; for the deposit of Faith or the truths are one thing and the manner in which they are enunciated, in the same meaning and understanding, is another. In pastoral care, sufficient use must be made not only of theological principles, but also of the findings of the secular sciences, especially of psychology and sociology, so that the faithful may be brought to a more adequate and mature life of faith. A theological system is supposed to satisfy two basic needs: the statement of the truth of the Christian message and the interpretation of this truth for every new generation. Theology moves back and forth between two poles, the eternal truth of it foundation and the temporal situation in which the eternal truth must be received…”Kerygmatic” theology…emphasizes the unchangeable truth of the message (kerygma) over agains the changing demands of the situation…This message is contained in the Bible, but it is not identical with the Bible. It is expressed in the classical tradition of Christian theology, but it is not identical with any form of that tradition…The “situation” theology must consider is the creative interpretation of existence, an interpretation which is carried on in every period of history under all kinds of psychological and sociological conditions…Only a courageous participation in the “situation”, that is, in all the various cultural forms which express modern man’s interpretation of his existence, can overcome the present oscillation of kerygmatic theology between the freedom implied in the genuine kerygma and its orthodox fixation. …the Church has always had the duty of scrutinizing the signs of the times and of interpreting them in the light of the Gospel. Thus, in language intelligible to each generation, she can respond to the perennial questions which men ask about this present life and the life to come, and about the relationship of the one to the other. We must therefore recognize and understand the world in which we live, its explanations, its longings, and its often dramatic characteristics. Human beings are seek meaning to their lives; it is part of our nature to seek to interpret our experience. Philosophy concerns itself with ultimate questions about existence, and Science seeks knowledge of the physical world of that experience. From these two primary indicators, others follow: Technology exhibits tools of and for human development, and that development is expressed in the Arts, regulated by Politics, and measured by Economics. As with the Sources page, these buttons link to detail pages which explore each section in greater detail with additional links for further reference. I have taken Tillich’s analysis of the “Situation” of the “Message” and Vatican II’s concept of the Signs of the Times to compose the second page of the Overview tab; 6 sections that identify those aspects of culture that affect the worldview of human beings in any given time, and therefore, affect the communication of the Christian message. Using Nichols’ identification of the theological Sources and Vatican II’s acknowledgement of the Signs of the Times (based, in part, on Tillich’s seminal recognition of “Message vs. Situation”), I designed the Overview tab to present Theology in its classical Thomistic formulation of “faith seeking understanding”; a process that seeks to uncover and understand Divine Revelation within the life of the Church in light of any given cultural situation. I believe the graphical layout of the tab visually represents these relationships and enables students to more easily understand the nature of theological dialectic. I have attempted to root Theologica deeply in the foundational structure of Theology, and I hope that effort is reflected in both the UI and the content of the Overview tab. This entry was posted in Technology and tagged Apple, Christianity, iOS, theology. Bookmark the permalink. Looking forward to seeing more posts. Congrats on the new app.